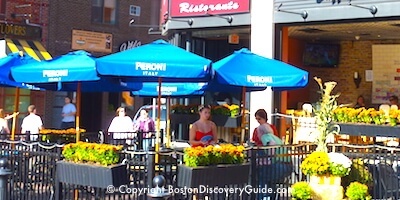 Want to explore Boston when your cruise ship stops at the Black Falcon Cruise Terminal for a Port of Call visit? 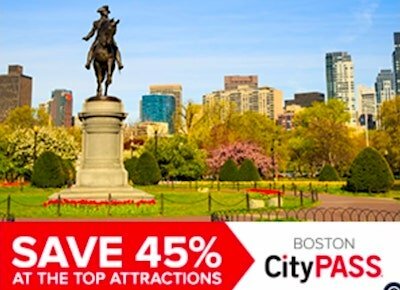 Port of Call visits typically give you about 8-10 hours in Boston - plenty of time to see many top historic and modern attractions due to the city's compact size. For the ultimate convenience, choose a shore excursion tour designed specifically for cruise ship visitors. They pick you up close to the CruisePort, and are designed to make sure you're back in plenty of time to re-board your ship before departure. 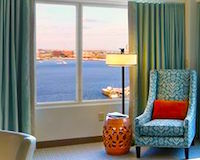 You can book two of the most popular Boston shore excursion tours online, sometimes saving quite a lot compared with making reservations through your cruise ship or travel agent. Alternately, you can easily explore on your own. 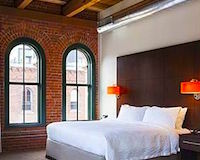 Unlike some ports where getting into the nearest city can be a hassle, the Black Falcon Terminal is in Boston's trendiest waterfront neighborhood, and just a short walk from other top attractions such as the Freedom Trail. 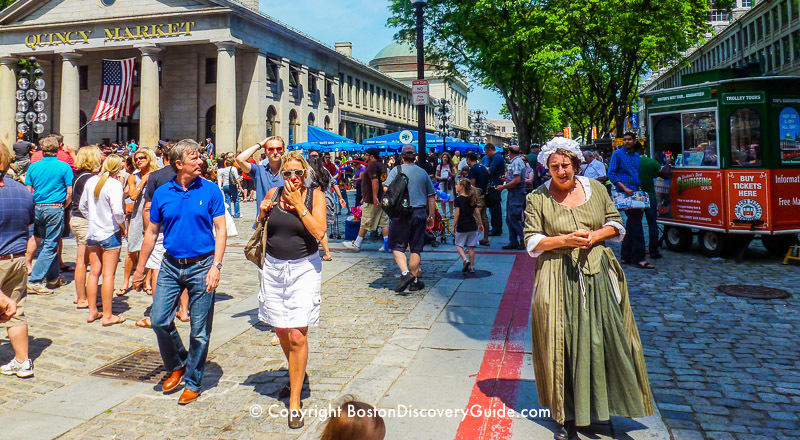 Here's a quick overview of Boston's shore excursion tours available for online booking, plus tips about what to see and do if you decide to head out on your own. 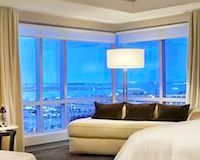 Two Boston shore excursions are available for you to book online, and both give you an exciting way to tour Boston. Choose the Hop On Hop Off Trolley Tour if you want an easy way to travel around the city at your own pace. You can easily spend the whole day traveling around the route and getting off to explore specific attractions or have lunch along the way. Opt for the half-day motor coach tour to Cambridge, Lexington, and Concord if you want to go beyond Boston to see famous Revolutionary War sites, bustling Harvard Square, and the lovely New England towns of Concord and Lexington. Board the Hop On Hop Off Trolley near the Cruise Terminal in Seaport, and get ready to see our top attractions and most spectacular neighborhoods. Ride the trolley for the whole narrated loop (about 2 hours) or get off and back on whenever you please. 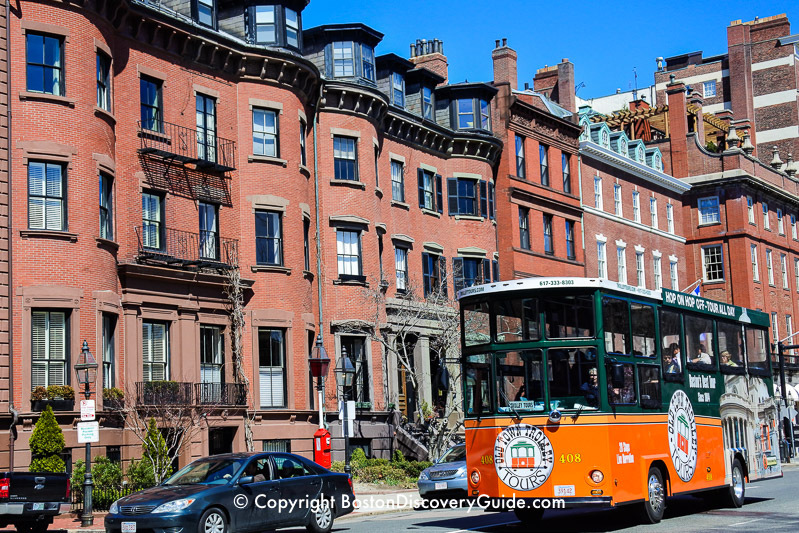 Stops include Faneuil Hall Marketplace, New England Aquarium, Newbury Street, Harvard, the Boston Tea Party Museum, and more. This special motor coach shore excursion tour to Revolutionary War sites takes you along Paul Revere's path on the famous night when he rode across the countryside sounding his famous warning to the Colonists: "The British are coming!" You get to visit Harvard Square, bucolic Lexington Green where the first battle of the Revolutionary War on April 19, 1775, and the Old North Bridge in Concord, where British troops met the wrath of Minutemen and local Militias who retaliated for those killed earlier in the day in Lexington. Boston's famous Freedom Trail is a 2.5 mile path linking 16 sites related to the beginning of the American Revolution and the fight for freedom and civil liberties. Take the Silver Line from the Black Falcon Cruise Terminal to South Station, and change to the Red Line and go to Park Station on Boston Common where the Freedom Trail begins. Walk along the Trail on your own, or opt for one of the many Freedom Trail tours, perhaps led by a costumed guide. Are you a baseball fan? If an afternoon game is scheduled - they typically start around 1pm - get tickets and head over to iconic Fenway Park, home to the Boston Red Sox. Depending on when you need to be back at the cruise terminal, you may have to leave before the game ends - but it's still a perfect way to spend the afternoon. If no game is scheduled but you want to see the ball park (and perhaps enjoy yourself at some of the nearby sports bars), you can still take a Fenway Park tour. Boston is known for its huge New England Aquarium on the Downtown waterfront, and you can easily spend a whole day there. The Aquarium is also a great alternative for a rainy day. Easiest way to get there from your cruise ship? 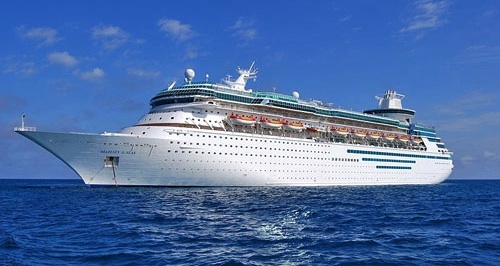 Hop on a water taxi right at the cruise terminal, and you'll be there in about 5 minutes. Do you have specific places you want to visit? 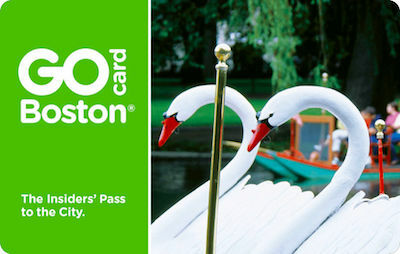 Boston sightseeing passes let you go straight to the front of most lines and get free admission to museums, whale watching cruise, Harbor cruises, and tours. Want to Stay near Cruiseport? 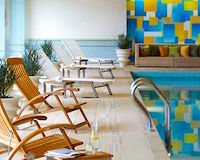 What is the best transportation to take from the Boston cruise terminal to Boston Logan Airport after our cruise? We'll have all our bags with us . . . I was wondering if you could offer some suggestions for us because we're traveling as a group of 16 (extended family). We are arriving at Logan on Saturday morning . . .
We're coming to Boston for the day for a Port of Call visit. 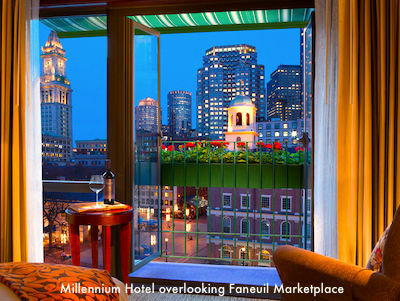 What's the best way to get to Faneuil Hall? Is there a shuttle? What else should we consider doing while . 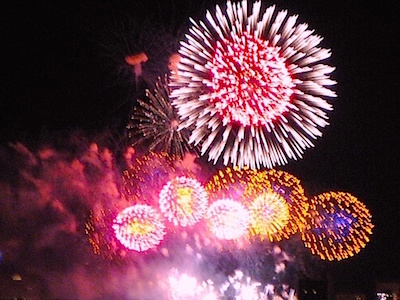 . .
Rainy Day Activities in Boston - What to do and see when you need a "Plan B"